Russia condemned the military coup d’état against Prime minister Nawaz Sharif in 1999 to remove the prime minister from power. On 19 April 2001, the Russian Deputy Minister of Foreign Affairs Alexander Losyukov paid a state visit to Pakistan where both countries agreed upon cooperating in economic development, and to work towards peace and prosperity in the region. In the wake of September 11, 2001 attacks, the relations warmed rapidly when Pakistan denounced the government of Taliban and joined the NATO coalition to hunt down the Jihadist organizations and al-Qaeda. 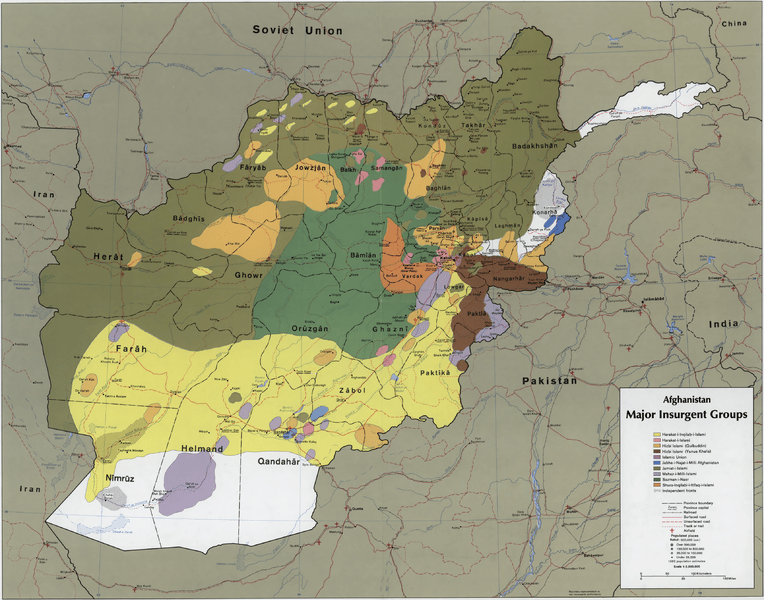 Afghanistan map after Soviet intervention : Showing areas involving heavy fighting. Note: Areas adjacent to Balochistan province remained untouched (white region, south) from the fighting while the NWFP (north-west) was inflicted with heavy fighting. The Pakistan Navy also coordinated with the supply of foreign weapons into Afghanistan, while some of its high-ranking admirals were responsible for storing the weapons in the Naval Logistics Depot. The Pakistani naval commanders rendered their cooperation for the weapons supply programme to the Mujahideen out of complete revenge because of Pakistan Navy’s terrible loss and defeat at the hands of Soviet Navy in 1971. In November 1982, General Zia traveled to the Soviet capital to attend the funeral of Leonid Brezhnev, then-General Secretary of the Communist Party of the Soviet Union. Soviet President Andrei Gromyko and the new Secretary-General Yuri Andropov met with Zia where a brief meeting took place at the Kremlin. The Soviet leader, the new Secretary General of the Communist Party of the USSR, Yuri Andropov was angry at Pakistan’s covert involvement in supporting the Afghan resistance against the Soviets and their satellite state Afghanistan. Soviet leaders expressed their indignation to the General. 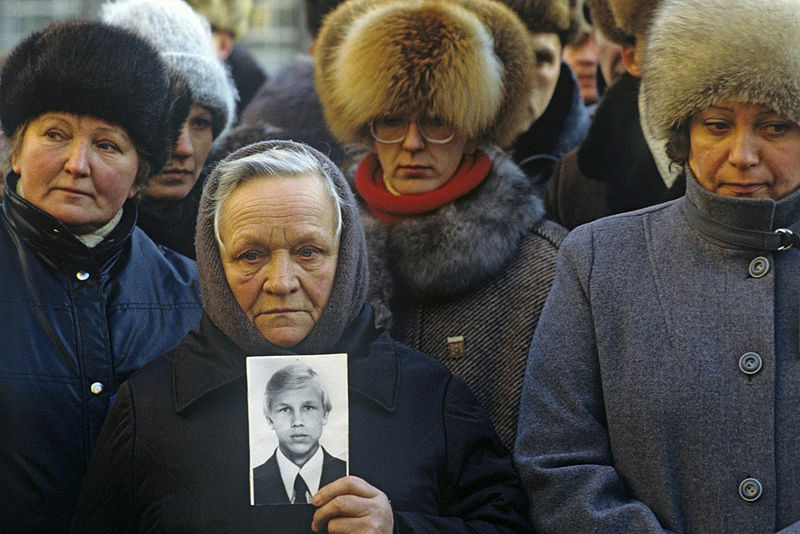 Mothers of Soviet soldiers meeting at the Pakistani Embassy in Moscow appealing to the Bhutto government for rescuing Soviet soldiers from captivity. It was not until 1992 when the Sharif government released the details of soldiers. After withdrawal of the Soviet troops from Afghanistan, relations began to normalize between Russia and Pakistan. And the fall of communism within Russia itself, provided further fillip to the Russia-Pakistan relationship. In 1989, Soviet ambassador to Pakistan offered to install in Pakistan a commercial nuclear power plant. However, after U.S. intervention the plan was thrown into cold storage. In 1994-95, Benazir Bhutto attempted to warm once again its relations with Russia but suffered a major setback when Benazir Bhutto government recognized Taliban-controlled government in Afghanistan as the legitimate government of Afghanistan. Yet in 1996, Russia willingly agreed to launch Pakistan’s second satellite, Badr-B, from its Baikonur Cosmodrome for the lowest possible charges. Pervez Musharraf shakes hands with a smiling Vladimir Putin (left), 2002. In 1997, Prime minister Nawaz Sharif attempted to warm relations with the Russian Federation after sending farewell messages to Russian leaders. In 1998, although Russians congratulated India for conducting second nuclear tests, (see Pokhran-II), Russia did not immediately criticize Pakistan for performing its nuclear tests (see Chagai-I and Chagai-II) in the end week of May 1998. On April 1999 Prime Minister Nawaz Sharif paid an important state visit to Kremlin, which was the first trip to Moscow by a Pakistani Prime minister in 25 years. No breakthrough could be made during this visit. In 1999, Russia welcomed Pakistan and India for making a breakthrough in their relations after signing the Lahore Declaration, but vehemently criticized Pakistan for holding Pakistan responsible for the outbreak of Indo-Pakistani War of Kargill in 1999. During this time, Russia played a major role in ending the war but still remained hostile to Pakistan. Russia condemned the military coup d’état against Prime minister Nawaz Sharif in 1999 to remove the prime minister from power. On 19 April 2001, the Russian Deputy Minister of Foreign Affairs Alexander Losyukov paid a state visit to Pakistan where both countries agreed upon cooperating in economic development, and to work towards peace and prosperity in the region. In the wake of September 11, 2001 attacks, the relations warmed rapidly when Pakistan denounced the government of Taliban and joined the NATO coalition to hunt down the Jihadist organizations and al-Qaeda. The decision of Pakistan to join the international struggle against terrorism has now led to a great improvement of Russia-Pakistan relations. Russia has also played an active role in easing off the nuclear 2001 Indo-Pakistani tensions. Russia vowed its support to Pakistan as Pakistan was fighting against the Taliban militants. In 2007, the relations between Pakistan and the Russian Federation were reactivated after the 3-day official visit of Russian Prime Minister Mikhail Fradkov. He was the first Russian prime minister ever to visit Pakistan in the post Soviet-era in 38 years. He had “in-depth discussions” with President Pervez Musharraf and Prime Minister Shaukat Aziz. Hina Kharr meeting with Russian deputy foreign minister A.N. Borodavkin, 2012. In 2011, Russia changed its policy and Putin publicly endorsed Pakistan’s bid to join the Shanghai Cooperation Organization and said that Pakistan was a very important partner in South Asia and the Muslim world for Russia. In 2011, Russia strongly condemned the NATO strike in Pakistan and the Russian foreign minister stated it is unacceptable to violate the sovereignty of a state, even when planning and carrying out counter-insurgent operations. In January 2012, reports emerged that Pakistan’s foreign minister Hina Rabbani Khar was set to leave for Moscow in the first half of February to formally invite Russian president to pay a state visit to Pakistan. If the Russian president who has accepted the invitation, and visits Pakistan, this would be the first ever visit by a Russian head of state to visit the country. The move is believed to be part of changes in Pakistan’s foreign policy which include efforts to open up relations with other regional powers following strains in relations with the United States. In 2012, Russian president Vladimir Putin announced to pay a state visit to Pakistan soon after his re-election. On 13 January 2013, in a gallop poll in seven countries managed by the Washington Post, to see whether the people of those seven countries prefer democratic government or one with a “strong” leader,  most Russians and the Pakistanis voted that “they prefer a “strong ruler” over democracy.